besides helping with most chemical reactions in the body are it produces and transports energy, it is a synthesizing protein with other vitamins and minerals to create structural components of the body, it transmits nerve signals and it relaxes muscles. With all these demands for magnesium in our bodies, it’s no wonder that 90% of us are deficient in this mineral! Why is it so hard to keep the right levels of magnesium in our bodies? The first reason is that the foods we eat are not as rich in magnesium as they used to be. The soils have been depleted of magnesium so even if you had the perfect diet you would be unable to get all the magnesium you need. A second reason is the world that we live in. How many people experience stress? We live in a very busy world with an endless to-do list and many demands on our time. Stress strips our bodies of magnesium. Also how much sugar do we consume daily? This also strips our bodies of magnesium. It takes fifty-three molecules of magnesium to process just one molecule of sugar. 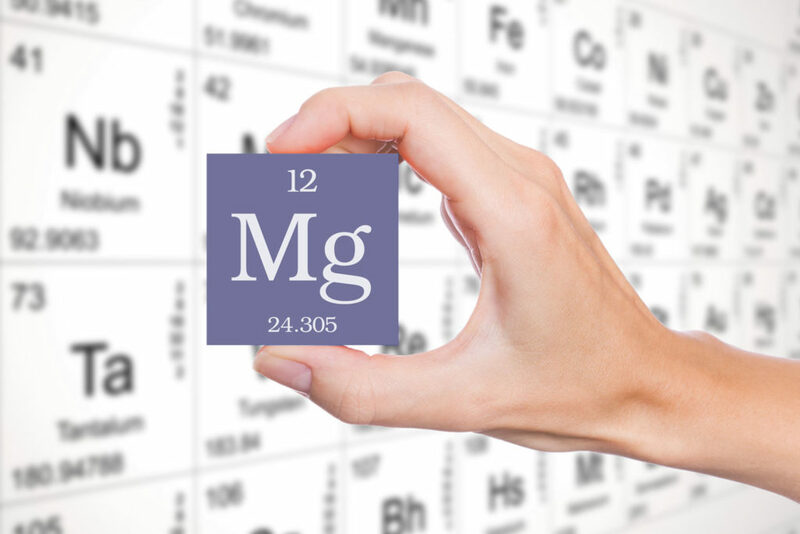 Anxiety, smoking, alcohol consumption, lack of sleep, and prescription medications are some other things that all strip magnesium from our bodies. So between the many demands for magnesium in our bodies and the number of things that can strip magnesium from our bodies it is vital to use a supplement of magnesium to be able to have the health that we want to enjoy. I’m going to list some diseases and common health problems that many people are familiar with that are all indicators of magnesium deficiency and in turn have been helped by magnesium supplementation. Keep in mind, this is not a comprehensive list just a few of them. Here we go: addictions, angina, anxiety, arthritis, asthma, blood clots, constipation, diarrhea, Crohn’s disease, chronic back pain, chronic fatigue, concentration difficulties, depression, diabetes, fibromyalgia, food cravings, headaches, heart disease, high blood pressure, hyperactivity, infertility, insomnia, irritability, kidney stones, osteoporosis, restlessness, stroke, thyroid hyperactivity, tooth decay and wheezing. I’m sure we all know someone who has experienced these problems as well as having some of them ourselves. As you can see from this list, magnesium deficiency can affect virtually every organ system in the body. With this knowledge you definitely want to supplement so your body can have the magnesium it needs to maintain your health, right? You know you need magnesium and you know why, but what is the best way to get it? Should you run right out to your local grocery store and buy a magnesium pill? Unfortunately that will not help you very much. You will get some short-term benefits from an oral supplement, but it actually does more harm in the long run. It has been shown that only about 1% of what you take orally can be used by your body. This will not allow your body to get all the magnesium it needs for each cell to perform optimally. Another disadvantage of oral supplements is they usually cause a laxative effect. This ends up flushing out the magnesium faster than you can put it in as well as all the other nutrients in your body. You may be thinking that if you can’t get the needed magnesium orally, then how do you get it? The answer may surprise you, but you soak it in through your feet! By using a pure form of magnesium chloride oil (the exact form your body uses) mixed with warm water you can reach magnesium cell saturation within a month by devoting at least twenty minutes a day to soaking your feet. This way bypasses your liver and stomach so your body can start using the magnesium where it needs it the most. One of the best things is you also can’t overdose on magnesium because your body will only uptake what it needs by doing it this way! I love sharing these things I have learned about magnesium from a great educator as well as a couple different books that I have read. This all makes a lot of sense to me with my background in nursing and I hope I’ve been able to share it with you in a way that anyone can understand the magic behind the magnesium. If by chance I have created more questions than answers for you or if you want to learn more about the magnesium soaking protocol and take step in the right direction toward health, then please contact me or attend one of the magnesium foot soaking classes that I offer on a regular basis!